You've seen the world end with fire, earthquakes, and WTF in movies like 2012 and The Core. But to find out about truly horrific, plausible scenarios you need to ask a scientist. We talked to Cal Tech's Joe Kirschvink, a geobiologist who studies the ancient history of life — and mass death. He gave us a nightmare scenario where one evolutionary shift in ocean microbes leaves humans unable to breathe. Kirshvink is an expert in one of the most dramatic transformations that's ever shaken our planet. You may not realize this, but for almost 2 billion years of the 4.5 billion year history of Earth, our planet's atmosphere was dominated by methane and other greenhouse gases. There was no free oxygen, and therefore no life as we know it could survive. But then, about 2.35 billion years ago, microbes called cyanobacteria — also known as blue-green algae — began to produce free oxygen as a byproduct of the photosynthesis process. The algae did this by breaking apart water molecules during their digestive process, freeing the O (oxygen) from H2O (water). As a result, these cyanobacteria poisoned the world. At least, that's how it would have seemed to all the microbes around them, known as stromatolites, who breathed methane. Suddenly, all this oxygen was in the air and the stromatolites began to die out. Eventually the oxygen-based atmosphere allowed life as we know it (including humans) to evolve. Over the dead bodies of those methane-breathing stromatolites. So that's the backstory. The thing is, we really aren't sure what caused the cyanobacteria to start photosynthesizing and throwing off all that free oxygen in the first place. And there's no reason such an evolutionary shift couldn't happen again, with equally disastrous results for all life on Earth. "Here's my nightmare scenario," Kirschvink began. "And it really is a nightmare. It's chemically unreasonable. But I suppose the microbes living 2.35 billion years ago would have said the same things about oxygen." Warming to the topic, he spun out microbial death tale. "Let's say that there's some damn diatom that learns to grab a photon and take salt," he mused. Instead of grabbing a photon and taking H2O like the cynaobacteria, this microbe takes salt from the ocean waters instead. Salt, if you recall your basic chemistry, is NaCl, or sodium chloride. The diatom breaks this in half, leaving a sodium metal which Kirschvink says it could store in "a little organelle." And instead of releasing free oxygen as a byproduct, this new diatom releases chlorine gas — a deadly poison. "You have chlorine gas poisoning the atmosphere," Kirschvink concludes. "It would do to us what oxygen did to those juicy stromatolites." Could such a scenario come to pass? 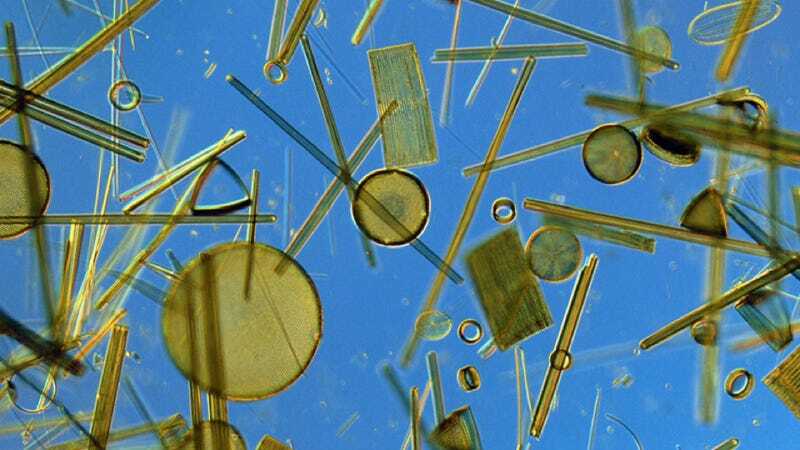 "It's just one small change in the metabolic pathways" of the diatom, Kirschvink noted. Of course, there is no known evolutionary advantage to such a shift taking place. But then again, there is no known advantage to cyanobacteria developing a metabolism that farted out oxygen 2.35 billion years ago, either. Next time you're looking for a doomsday scenario, consider the humble diatom.